ROV Deep Discoverer collects a sample of Anthomastus, by far the most dominant fauna observed on Beethoven Ridge. This image shows an example of the abundance of the coral in the area surveyed. Image courtesy of the NOAA Office of Ocean Exploration and Research, Deep-Sea Symphony: Exploring the Musicians Seamounts. Download larger version (577 KB). Sir Arthur C. Clarke once wrote, “How inappropriate to call this planet Earth when it is quite clearly Ocean.” The ocean covers 70 percent of the planet and produces more than half of the oxygen in the atmosphere. We rely on the ocean for food, transportation, and recreation. The ocean touches all of our lives in ways that we may not always realize. However, much of the ocean remains unexplored. In the distance, you can see on of the colonies of Iridogorgia spotted on Dive 02 at “Beach” Seamount. Not only is Iridogorgia my favorite deep-sea coral, but this was likely a significant depth extension for the species. Image courtesy of the NOAA Office of Ocean Exploration and Research, Deep-Sea Symphony: Exploring the Musicians Seamounts. Download larger version (jpg, 530 KB). For the last three years, NOAA has explored some of the most remote parts of our nation’s marine national monuments and marine protected areas as part of the Campaign to Address the Pacific monument Science, Technology, and Ocean NEeds (CAPSTONE). 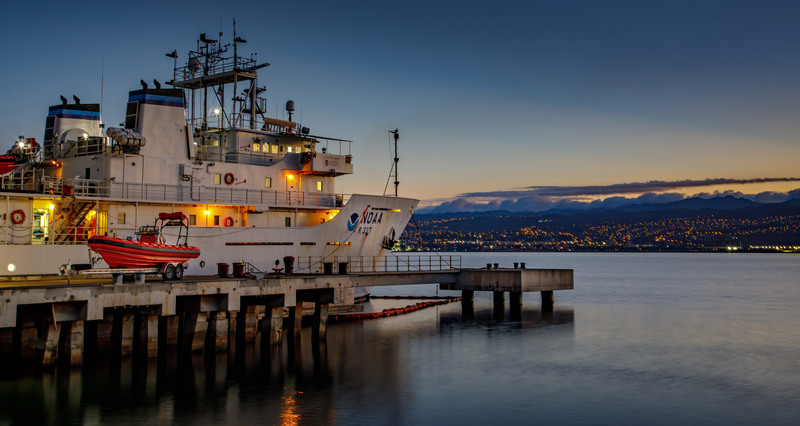 We’ve discovered new hydrothermal vents, high-density coral and sponge communities, potentially new species, and historic maritime heritage sites. We’ve mapped new seamounts and revealed new geologic features. It’s been an exciting and unprecedented three years of ocean exploration. 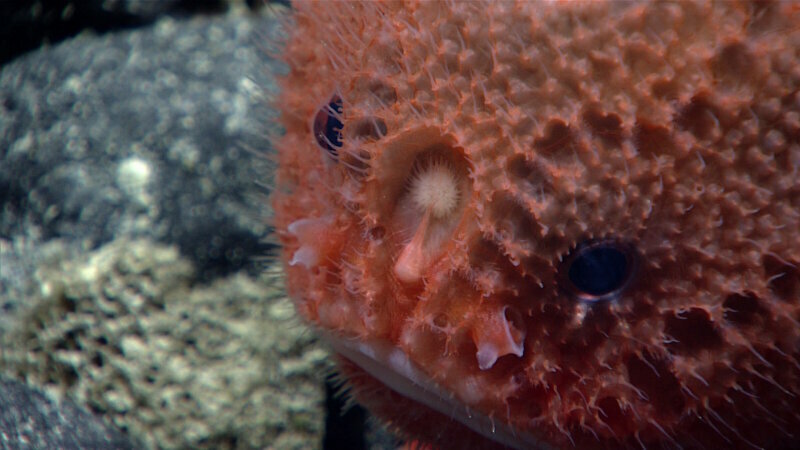 A particularly adorable chaunax observed on Dive 03 at Beethoven Ridge. Image courtesy of the NOAA Office of Ocean Exploration and Research, Deep-Sea Symphony: Exploring the Musicians Seamounts. Download larger version (jpg, 380 KB). Marine animals, such as fish and corals, do not recognize geopolitical boundaries of the world’s ocean. 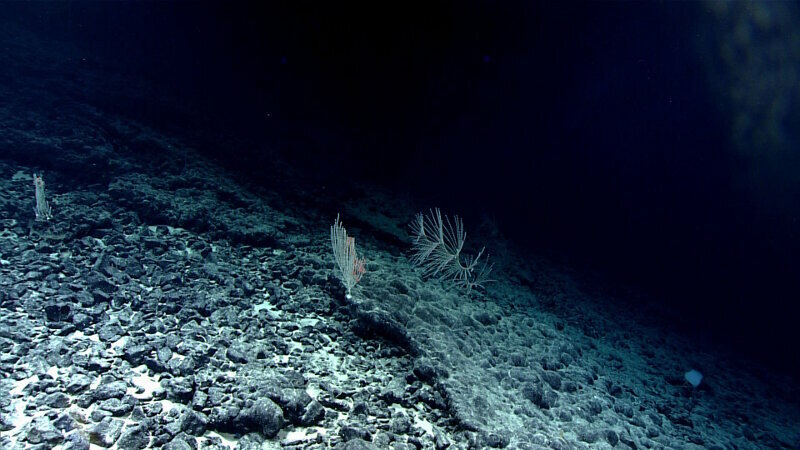 As one of the closest seamount groups to the Hawaiian Islands, the Musicians may serve as refuge for transient fish populations that Hawaii relies upon, provide additional habitat, and serve as a pool of genetic diversity for deep-sea coral populations known from the deep waters around the Hawaiian Islands. 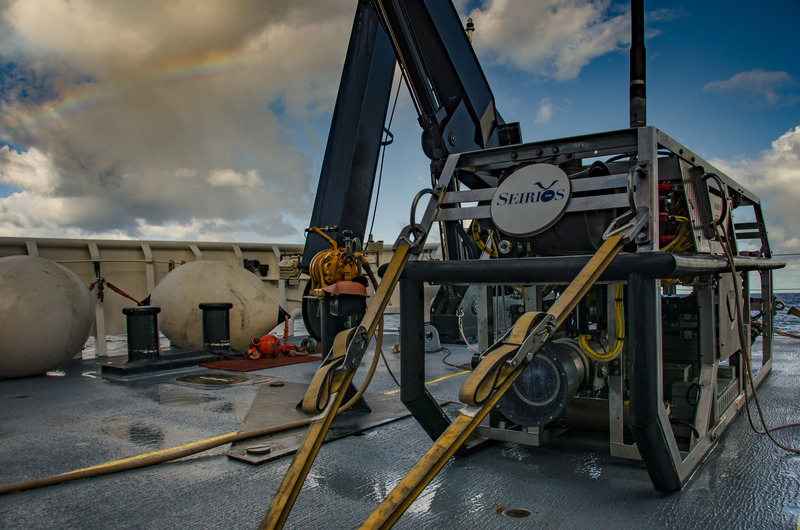 Beyond characterizing the benthic habitats, this cruise provides us the opportunity to explore the water column, one of the least understood biomes on the planet. On this expedition, we’ll also conduct our first ever full-day water column dives! 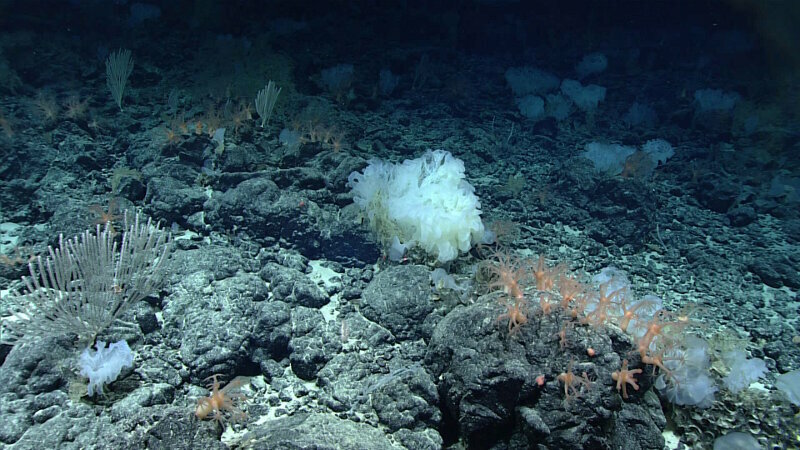 During the Deep-Sea Symphony expedition, we’re hoping to find deep-sea coral and sponge communities, particularly high-density communities, like this one at the summit of Beethoven Ridge. This community is a little different than others we have seen during CAPSTONE based on the dominance of Anthomastus and a large glass sponge. Image courtesy of the NOAA Office of Ocean Exploration and Research, Deep-Sea Symphony: Exploring the Musicians Seamounts. Download larger version (jpg, 684 KB). 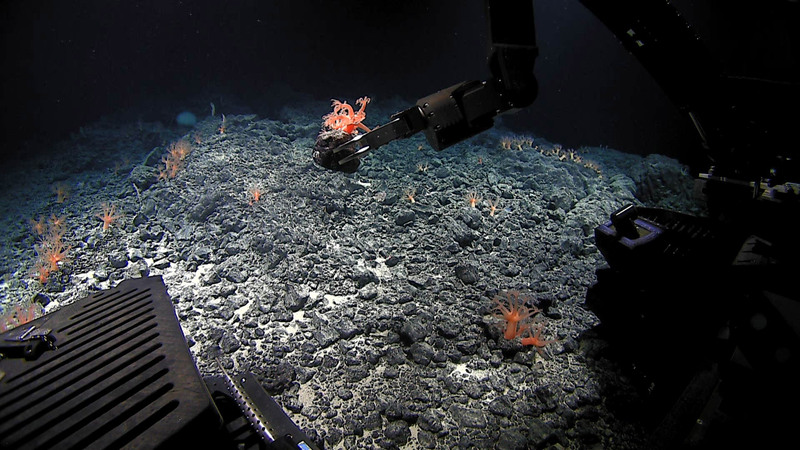 Additionally, the Musicians Seamounts offer a unique opportunity to expand our geological knowledge of fracture zones, hotspot volcanism, and how these features interact in areas where they coexist. The Musicians sit at the northernmost edge of the Prime Crust Zone, an area of the Pacific with the highest levels of commercially valuable deep-sea mineral deposits. However, there is limited data about this region, and expanding on this data set may better inform models of manganese crust accretion. Due to the limited geological knowledge and data in the region, we will target rock samples with manganese encrustation and samples that will give scientists the opportunity to learn more about the age of the diversity of features located in the region. What’s beneath the rainbow? It’s Seiros just before launch on our first dive in the Musicians Seamounts. 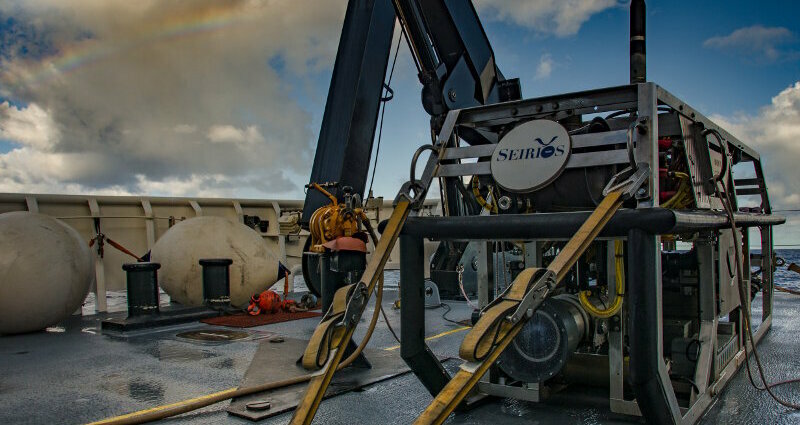 Image courtesy of the NOAA Office of Ocean Exploration and Research, Deep-Sea Symphony: Exploring the Musicians Seamounts, and Caitlin Bailey. Download larger version (jpg, 4.2 MB). NOAA Ship Okeanos Explorer shortly before departing for the last expedition of NOAA’s Campaign to Address Pacific monument, Science, Technology, and Ocean NEeds (CAPSTONE), a three-year initiative to collect deepwater baseline information to support science and management decisions in and around U.S. marine protected areas in the central and western Pacific. Image courtesy of the NOAA Office of Ocean Exploration and Research, Deep-Sea Symphony: Exploring the Musicians Seamounts, and Art Howard. Download larger version (jpg, 3.2 MB).